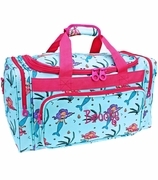 Whimsical mermaids with a sea theme create the perfect lunch tote for little girls. Trimmed in hot pink, still their favorite, they can pack and carry their school lunch, take a snack to the library or park. The bag offers a spacious main compartment to hold fruit, sandwiches and a drinking bottle. 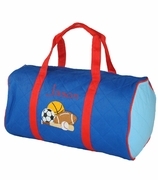 A three-sided zipper closure ensures that contents are safe and secure. Carry it using the grab-and-go handle on the top and add some summer fun to the day. 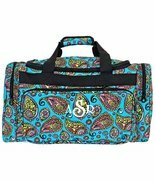 Add a matching duffle bag for a complete set search item SWT-T20MMAID or backpack item SW-6016MMAID. Personalization available at no charge on all items. The embroidered lunch tote measures 9.5 x 7.5 x 5.